In August 2011, Nas released 'Nasty' as the lead single for his new project Life Is Good. The track showcased a veteran rapper still hungry to demonstrate his skills; the freewheeling, hook-less virtuoso performance reminding listeners of an artist still desperate to top the classic Illmatic. Then all went quiet. Fans had to wait until the following April for a second single, the rousing, Heavy D produced 'The Don' further whetting appetites for the main event. After numerous well received track leaks, July 17th has rolled around, Life Is Good finally held up to the scrutiny of the hip hop community. 'No Introduction' opens the album, soft piano backing the Justice League produced track. Nas ranges over a variety of topics, cushioning gangsta trash talk between revolutionary plans and reminiscing about meetings with Biggie. The financially draining divorce that thematically shapes much of the LP is lightly brushed upon, revealing the motivation for the album: "I wrote this piece to get closure/ Some of you may know Kelis/ This goes to her with love, also goes to y'all to see/ The craziest things already happened to me/ Either you'll be laughing with me or be laughing at me." Second track 'Loco-Motive' finds Nas on sparkling, vintage form. The listener is transported back to the grimy 90's, the train wheels providing the backdrop for the Queensbridge native to paint pictures of the dark New York underbelly. On a similar subject, 'A Queens Story' becomes a more personal ode to friends lost since his career blossomed. Rick Ross drops in on 'Accident Murderers' for the only rap feature on the album. Rozay holds his own impressively against Nasty Nas, the two MC's trading bars menacingly in a musical relationship that seems to be flourishing. The album then changes tone as it moves into 'Daughters', an introspective, meditative discussion of the challenges raising his teenage daughter. The track reveals a matured father figure, a far cry from the occasional misogyny of previous releases. The Anthony Hamilton assisted 'World's An Addiction' is arguably the best effort on an album filled with highlights. Over Hamilton's haunting hook, Nas documents a world of flagrant excess and damaging addiciton, despairing at the crumbling world he sees around him. The LP then moves into a soulful lull on 'Stay', the MC becoming conversational over the hazy, saxophone driven instrumental. Also included is 'Cherry Wine', a product of an unlikely friendship with Amy Winehouse. Unfortunately, there is one misstep included in the track listing. 'Summer on Smash' features the schizophrenic, all or nothing approach that characterises the production of the increasingly redundant Swizz Beats. The blatant attempt at radio exposure hinders an album that is otherwise excellent. Life Is Good ends with the emotional 'Bye Baby', in which the rapper tries to make sense of his failed marriage. 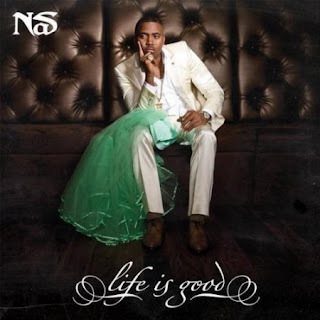 Nas' rhymes neatly encompass the variety of emotions synonymous with the break down of an important relationship, bittersweet memories sprinkled over a bed of directionless anger. This provides a suitable ending for an album that features the artist cradling his wife's green wedding dress on the sleeve, the only item left by Kelis after she cleared her belongings from the martial home. After a run of consistent, if unspectacular projects, Nas has returned with an album of astounding quality, fully justifying the hype generated over the course of the year. With 10 solo albums under his belt, Nas appears likely to extend his astonishing longevity a little further yet.